Today is a big day for Adobe. Not only is the company officially unveiling the next versions of virtually all of the applications in its Creative Suite, but Adobe is also launching its Creative Cloud online offerings. 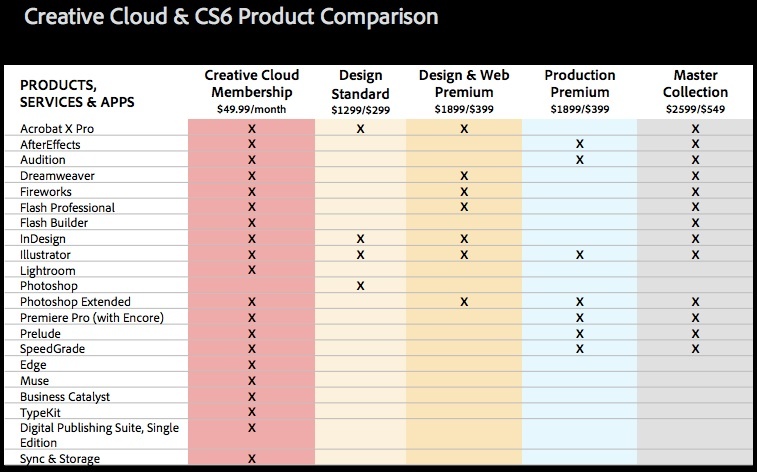 This marks a major change in how Adobe is selling and marketing its flagship product: while the company will continue to offer a shrink-wrapped version of CS6, it’s also introducing a subscription service with this update. For $49/month with an annual subscription or $79/month for month-to-month memberships, users can now get full access to any CS6 tool, including Photoshop, InDesign, Illustrator, Premiere Pro and AfterEffects. The suite will also include Adobe’s new HTML5 design and development tools Muse and Edge, and will be deeply integrated into the company’s tablet apps. Users will be able to download and install these apps on up to two machines. Photoshop, the most popular application in the suite, will also be available through a stand-alone subscription for $19.99/month with an annual membership and $29.99 without. Adobe will also offer a student and teacher edition of Creative Cloud for $29.99/month. Current CS3, CS4 and CS5.5 users will qualify for a special introductory offer of $29.99/month. In the coming months, Adobe will also launch a version of Creative Cloud for teams, though the price for this one hasn’t been determined yet. 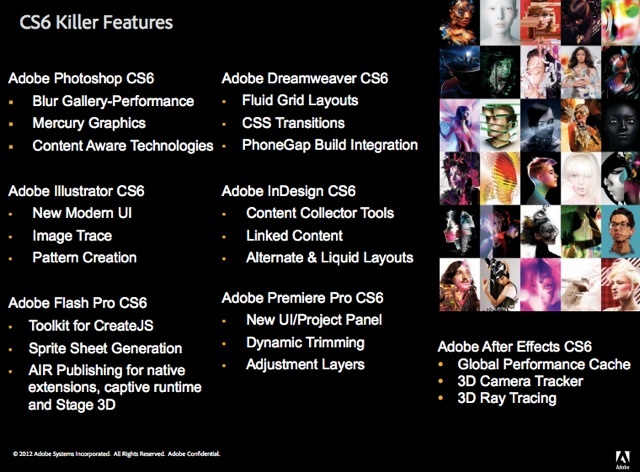 The updated Creative Suite apps obviously include a number of major changes, but maybe the most interesting change – and likely also the controversial one – is Adobe’s move toward a subscription service for CS6. The company obviously knows that quite a few of its users still want to buy the standard shrink-wrapped versions of its apps and will continue to offers these as well. Photoshop, of course, is among the most pirated applications and while Morris stressed that the subscription service shouldn’t be seen solely as a way to combat piracy, he did acknowledge that it has the potential to help Adobe with its piracy problem. Creative Cloud isn’t just a subscription service to Adobe’s tools, though, it also includes an online storage and sharing component. Adobe itself calls it its “hub for making, sharing and delivering creative work.” Subscribers will, among other things, be able to sync their files to Adobe’s cloud and then edit them with the company’s mobile tools on the iPad, for example, or just upload their files Dropbox-style to the web and share them with their clients or colleagues. Initially, users will have access to 20GB of online storage, with additional storage purchase options coming soon. Creative Cloud subscribers will also get access to Adobe’s publishing and web hosting services, which will allow them to easily publish their apps, magazines and catalogs to iOS, Android and the web. Members will also get access to Typekit, which offers web designers access to 700 fonts. The forthcoming team version of Creative Cloud will give users access to more storage and administrators will be able to allocate disk space depending on individual users’ needs. In addition, Adobe will provide these subscribers access to something akin to Apple’s Genius Bar where users can get one-on-one advice and support. Another aspect of Creative Cloud will be its community site that will include a deviantART-like component for publicly sharing work with others.